UDM Downloads > Keyboard Monitor! Police the activities that take place on your computer with this handy program. Turn it on and it records all the keys that are pressed until turned off. Use it to ensure that your child (or spouse!) chat room and email activities are on the up and up. Recorded information and access to the Keyboard Monitor are safely password protected. 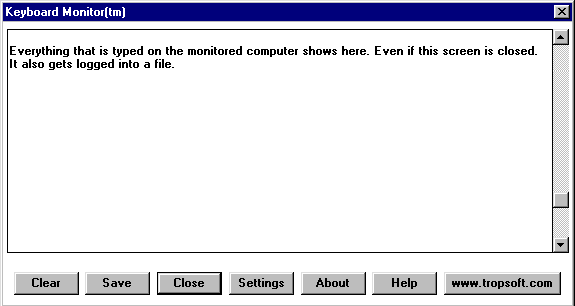 Keyboard Monitor can be run as an invisible background process and it can be set so that it turns on automatically when the machine starts up.